The whole 50T/18H testliner paper making plant by using LOCC as raw material contains two parts: LOCC stock preparation line and testliner paper making machinery. First of all, recycled paper is conveyed into pulping equipment like D type hydrapulper by chain conveyor. After the preliminary pulping, the pulp is conveyed into the High density cleaner for cleaning heavy impurities in pulp. 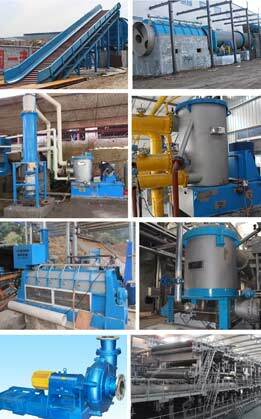 Afterwards, it will be conveyed into the pulp screening system equipment like Mid consistency pressure, Reject separator for the coarse screening and fine screening of paper pulp. In addition to that, to improve the breaking degree of pulp, the paper pulp is conveyed into pulp refining equipment like ZDP series double disc refiner for further processing. Finally, the pulp is conveyed into NLS inflow pressure screen for the last step of pulp processing. After that, the pulp is conveyed into headbox for paper making. Leizhan testliner paper machinery has a basis weight range of 80-220g/m2 and trimmed width range of 1880-5800mm. The paper machine speed range from 150/min to 800m/min. Moreveor, Leizhan paper machinery applies QCS automatic control system, which makes it easier to control and operate.